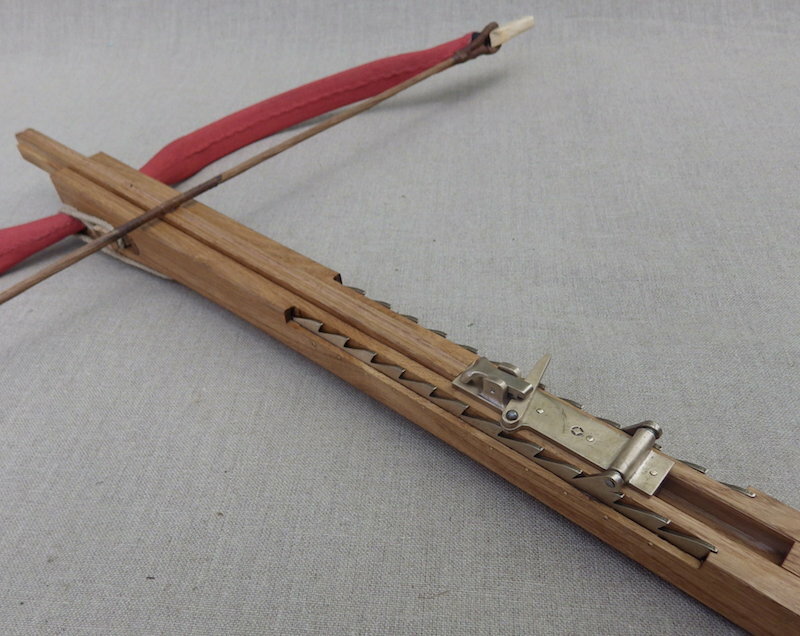 This is a rather unusual bow for me and is a classical Greek crossbow equivalent. The evidence for these is rather scant and I suspect Dan Howard will know much more, but this is my interpretation of one. 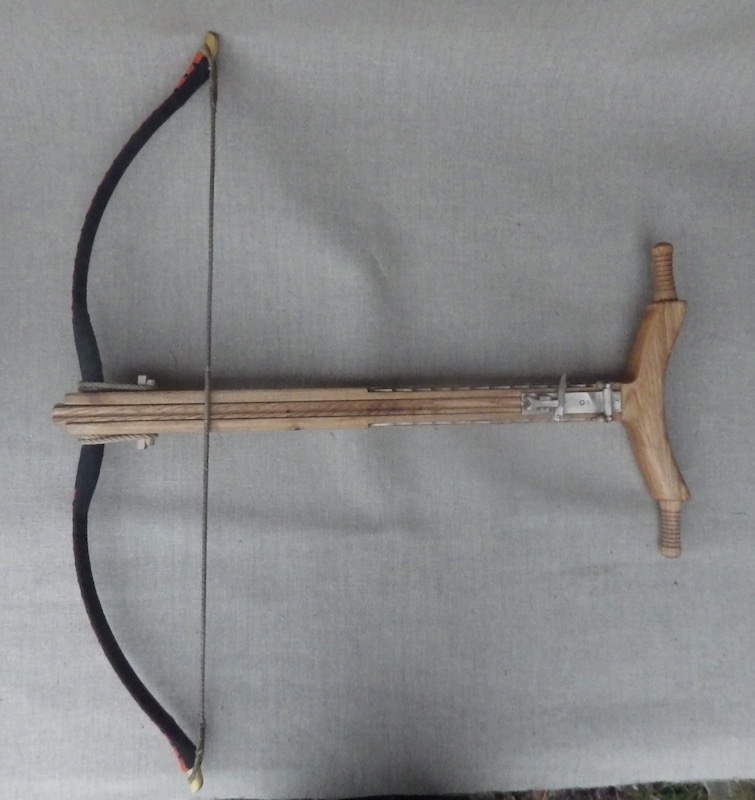 It is loaded quite differently to a conventional crossbow and shares many similarities with Greek and Roman torsion artillery with the very notable exception that the bow is of a conventional type rather than torsion. 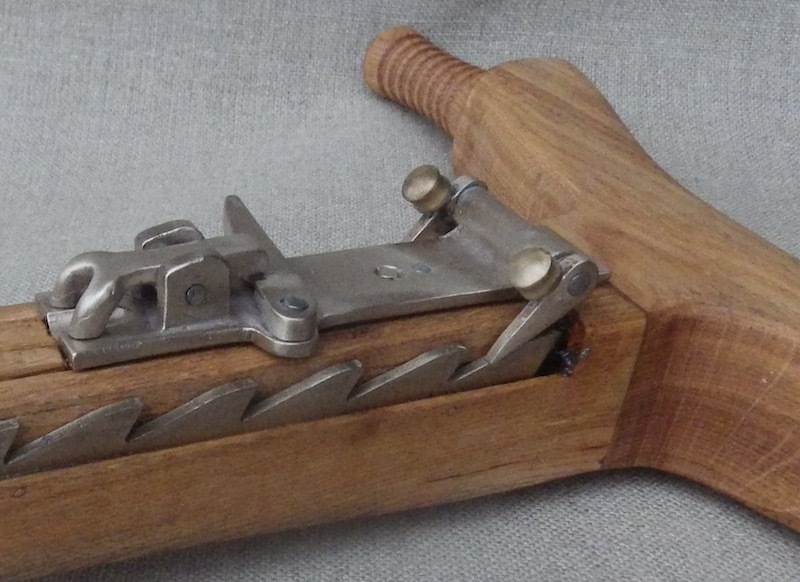 It is loaded by rotating the pawls on the side of the trigger block away from the teeth on the stock. The slide is then pushed forward until the string engages with the fork. The fork is locked with the trigger bar, the pawls are rotated forward and then the user leans forward on the bow so that the slide pushes against the ground and the string is pushed back until the pawls engage with the teeth. 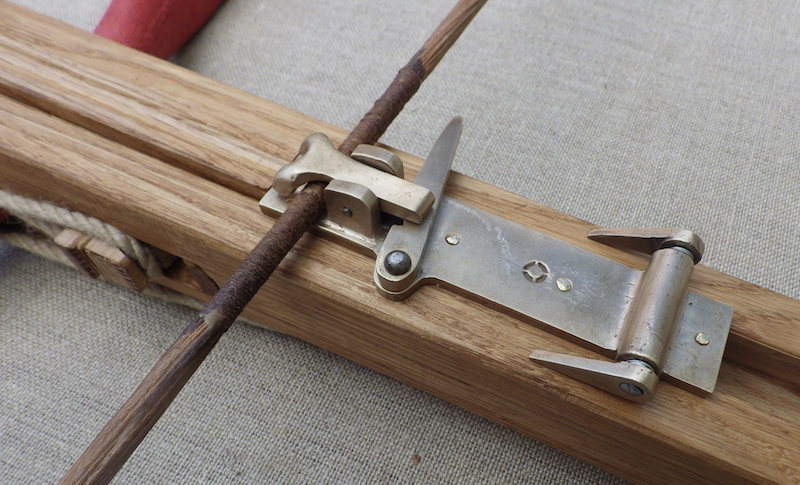 The bow is then lifted so that the curved bar rests against the belly and is shot. Both the method of loading, by pushing down on the bow by leaning on it and the raising of the bow to the stomach to shoot presumably lead to the name ‘Gastrophetes’ which means ‘belly bow’. This was a complicated reproduction for me as much as there not really being one to copy and that it was rather technical, but was very interesting none the less. I will be posting up a video in due course showing being shot. 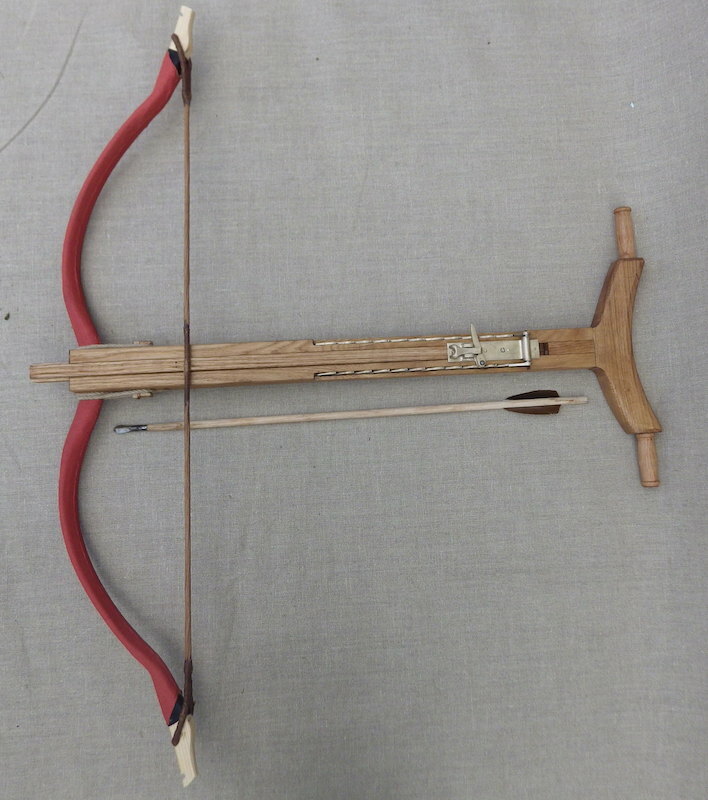 The bow in this instance is in fact a fibreglass horse bow made by Kassai and is 110lb, but with the very fast nature of these bows and the long draw length make this a very powerful bow indeed. The bow was shortened and covered in painted linen to hide its origins and fitted with a linen string. For want of any further information the string was made like medieval crossbow strings. The original bows were presumably composite and displayed this recurved form. The stock is seasoned oak and all the trigger and teeth parts are bronze. There is (as far as I know) no information on how the bow was secured to the stock and so I have opted for lashing which I feel is the most likely; allied to this I wanted to make the bow removable for easy modern life. 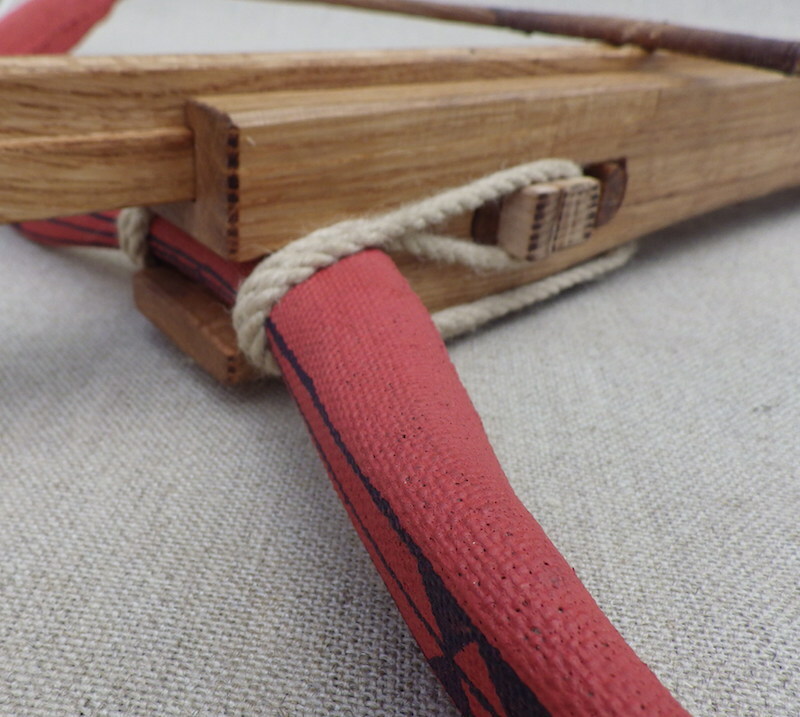 With this in mind I used a lashed and wedged system that I conceived for this bow. 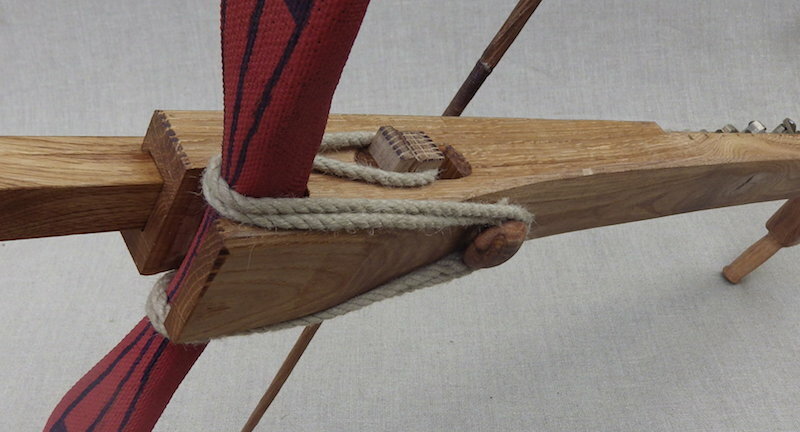 Whether they were like this I have no idea, but it fixes the bow, make it removable and the Greeks certainly used opposing wedges for tightening the bundles on their torsion artillery so it was a system that would have been open to them and understood, even if not used. I hope you like it - I love it! Very interesting design even if you had to guess at and improvise some of the details of assembly: Even if not historically certain in details, the period ones had to function basically the same way to be able to do the same thing. 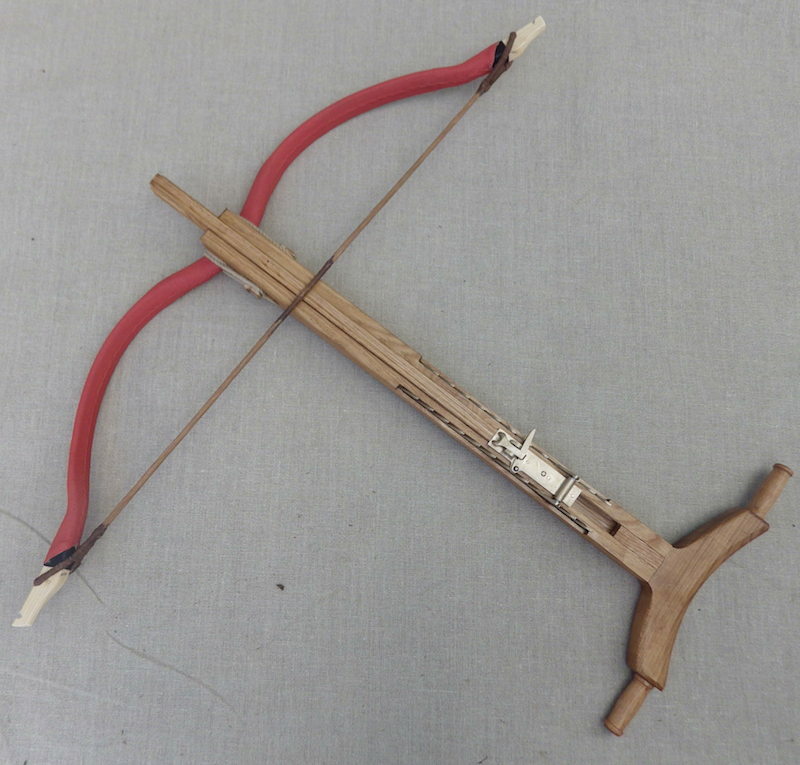 Seems like a very efficient design with some advantages over the Medieval crossbows in having a longer draw length. It would be interesting seeing it in use and how much velocity and energy one gets out of the arrow/bolt compared to a heavier draw medieval crossbow: I'm guessing that it might perform as well or better than a 350 lb. crossbow ? Leo your work with crossbows is just wonderful. What a treasure to have if I ever owned one. This is a fantastic study of this weapon type. Ingenious construction and very nicely executed. I would love to see how it performs. Looks like it would be great fun to use! As one of the two proud future owners who commission Tod to make this gastraphetes and a second one of the same type, I am absolutely thrilled with the finished article and Tod's interpretation of what little evidence we had to go on. The gastraphetes shown is modelled on the Zopyrus of Taras version that he produced some time before 421bc, having improved on earlier versions. 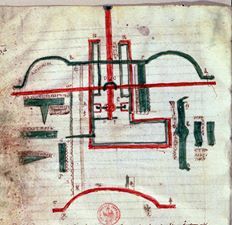 Zopyrus of Taras, the Pythagorean mathematikoi, is generally credited by academics as the creator of this first working gastraphetes that all future versions developed from. We do not know as to what use these weapons were put but Taras (modern Taranto) was engaged in frequent wars with neighbouring cities and territories where seige warfare was common, and, being a coastal city, had a thriving navy and many "privateers" or "Leistes" amongst their ship owners. These two gastraphetes will make a valuable addition to The Hoplite Association displays and a treasured addition to my personal collection. But it is not mine alone. It protects my brother on my left. nor my Country out of its shelter. Again an another marvel to come out from you workshop! What a fascinating weapon! I have read of such a bow in (Ospreys?) book about ancient Greek artillery and again as it is 'used' in Christian Cameron's excellent book "Destroyer of Cities" of the "Tyrant" series. And now, you bring the illustrations and text into reality, wow! Taras? That wouldn't have been surprising, since they particularly had a great deal of trouble with some nasty barbarians from the north who called themselves R*mans. ive been a little confused by the gastraphetes, i have some sources saying it was a hugs wall mounted thing like was shown in that documentary... and some saying they were the size of your fairly average crossbow... obviously there might have been a whole range of sizes but which was the commonly used size that would have been described in texts etc..?? Thank you very much for your kind words and it was a great object to have recreated. I have shot some footage of it being used and as soon as I can work out how to edit it I will post it up on youtube. 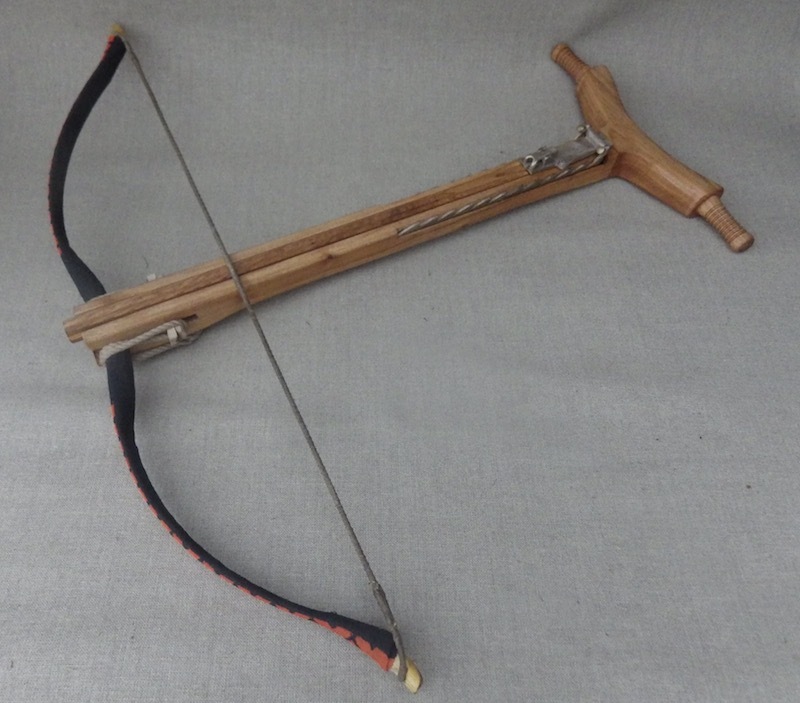 I may have made it, but the finer points of its use and context pass me by as it is not my area of special interest, however I would say that the name 'belly bow/stomach bow' suggests that it would be a smallish hand held weapon rather than a larger stand mounted one. Also the mode of loading requires it to be hand held. I have read a few of the Tyrant series, but not in fact this one, but I believe that the bow is going to another member of the Hoplite Society, of which he is a part, so that is nice. I liked these books of his and thought them well and thoughtfully written, however I have not long since finished 'Ill made Knight' by the same author and that I really loved; if 14thC Europe in turmoil is your thing - read this book. Please, please, show us the bow in action! I am still finding it bit difficult to understand just how the spanning mechanism really works. Slightly off-topic, but I read the "Ill made knight" right after it was published and loved it! Just waiting the sequel to come out! https://www.youtube.com/playlist?list=PL8Jh2gqWQ03i7Ze5153FtipAGdyoOSZ6T heres a playlist from my channel of videos ive found and favoritd that are about the gastraphetes and other missile weapons. and heres the documentary that shows the really big gastraphetes https://www.youtube.com/watch?v=OlxU6FUlNZU&list=PL1_ccT3COZY6Ctn62UD_ZTFrnTOG_2Cvd&index=8 it was unavailable in my country nowdays bit i had seen it a while back i think its from 'superweapons of the ancient world' or something..
How much detail could we extract from the sources about the dimensions, I wonder? Reconstructing Roman ballistae is obviously much easier since we have a detailed explanation from Vitruvius on how the parts should relate to each other proportion-wise, but I don't know whether any surviving source on the gastrophetes goes into so much detail. How much detail could we extract from the sources about the dimensions, I wonder? I was later sent this drawing which I believe is original and that I think is it as far as drawings go. Looks familiar. Is it from a medieval edition of De Rebus Bellicis? It took a while, but I have now posted a video of the gastraphetes in action and I hope you like it. As one comment said ' interesting, clumsy and slow'. Yes it is all of these things, but the bolts really do shift and it would be a game changer from a battlement compared to previous artillery options. Great work, Leo. And good video of it in action. Leo, what completely blows me away is the range of your work-from crossbows, to ancient ballistae to scabbards, swords leatherwork and foundry work. Most craftsmen are content to stick to one, perhaps two specialities. You appear to be proficient in at least six or seven very different areas, and it all looks soooo good. And to top it off, you are able to illustrate it all electronically for our enjoyment and education. I am in awe. Thank you Peter and thank you also Henry. Very generous words and mainly it is because I would get bored of one thing so I like to learn new things and then apply them. I never knew that ancient Greek soldiers also fought with crossbows like this one. 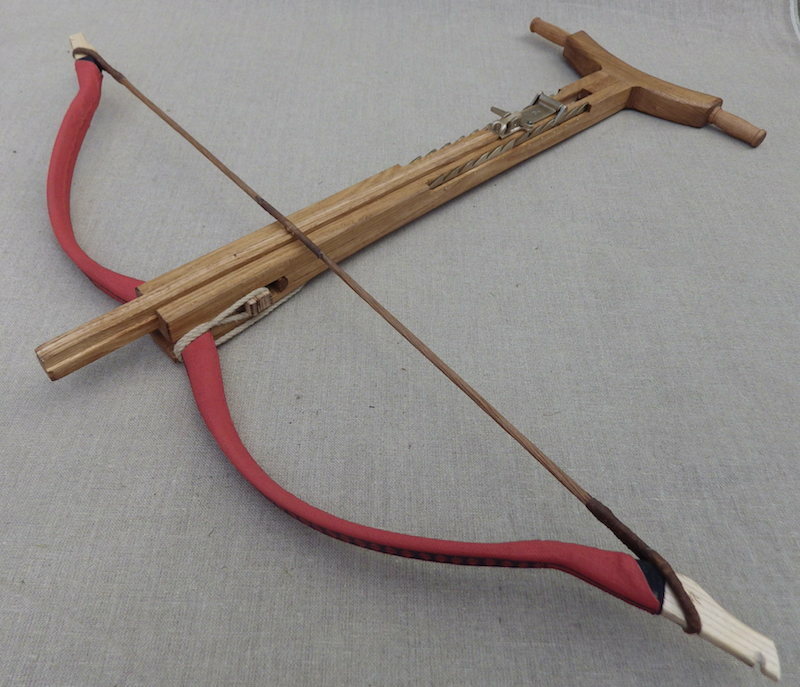 The gastrophetes is, without doubt, an ancient form of the crossbow. I have just finished another of these bows (this one going over to the US). It is basically the same as the previous bows in this line that I have made, except that the poundage of this one is 30lb rather than the 110 or 90 of the previous. 30lb is clearly a low weight, though it still shoots very nicely and at this weight, the whole concept of the bow is a little redundant; good for demonstrations though. However I personally felt that the 110 was too heavy and the 90 was still hard work, though very impressive. I was talking to the owner of the 90lb one a couple of weeks ago and he was easily clearing 250m with it and he felt that was not maximum range. 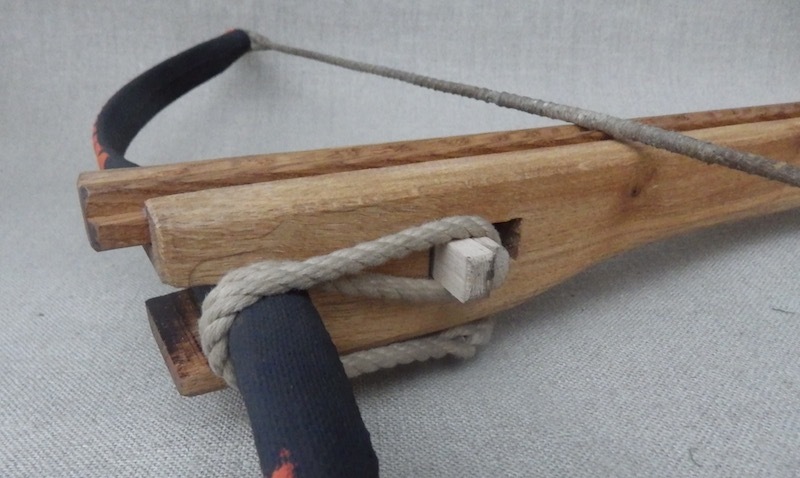 Anyway the point I was making was that for war maybe the 90lb is a good number, but for shooting fun and still damn impressive, I think that a 60 or 70lb bow on one of these would be a good weight.